This cute neckles ship directly from our different warehouses across the United States so you get your items quickly and in perfect condition. Our products are a 100% authentic and brand new. This SWAROVSKI ELEMENTS crystal “lucky cat” pendant necklace accents the diamond-shaped ruby accompanied by dozens of clear swaroviski element crystals. Originated from Japan, “Lucky Cat” is a symbol of good fortune. It’s very popular in Asia. 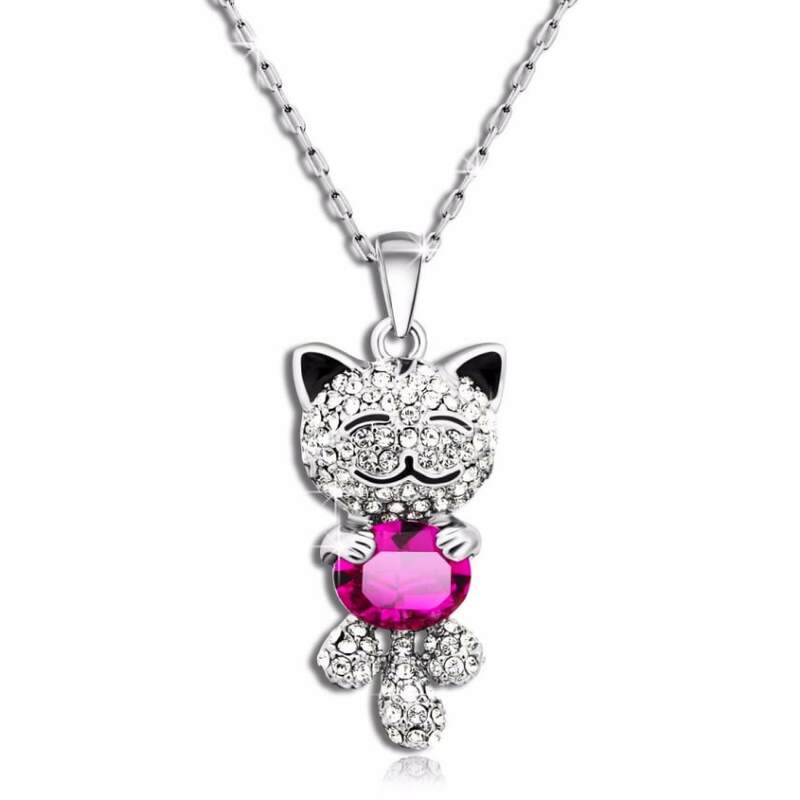 Just like the name “lucky cat”, this bling crystal necklace will obviously bring good luck to the wearers or your beloved who receive the cat pendant necklace as gifts. This lucky cat necklace is suitable for many occasions, like valentine day, engagement birthday party, cocktail and more. · BLING, QUALITY & ECO-FRIENDLY MATERIAL – Main stone: created rudy, other stones: crafted clear and transparent SWAROVSKI ELEMENTS crystals, metal: nickel free and anti-allergic alloy white gold plated Shining brightly. · “LUCKY CAT” – SYMBOL OF GOOD LUCK, CAPERCI CURATED 2015 EXQUISITE COLLECTION – Originated from Japan, Lucky Cat is a symbol of good fortune. It’s very popular in Asia. As its name “lucky cat” indicates, the crystal necklace will bring good luck to the wearers. Accented diamond-shaped ruby accompanied by dozens of clear swaroviski crystals, making a good gift for your girlfriend, lover, wife or mother to express your love. Perfect as engagement or wedding jewelry endowed with special significance. · PERFECT SIZE FOR LADIES & FREE GIFT POUCH WRAP – Specifications: chain length: 13.5″ + 2″ extender, pendant width: 0.61″, pendant height: 1.38″, necklace weight: 0.34 ounces. Free gift wrap with Caperci pouch. · SUITABLE FOR MANY OCCASIONS (TPO) & BEST GIFTS – A perfect accessory to your outfit or as an appropriate gift; Suitable for valentine day, engagement, wedding, party or any other special occasions. · ZERO RISK – QUALITY PRODUCTS & BEST CUSTOMER SERVICES GURANTEED – Caperci Inc. is committed to providing every customer with the most affordable jewelry and the best aftersale services. Shipping is FREE to all addresses other than APO/PO boxes in the lower 48 states. Unless stated otherwise, all orders will ship within 24 hours of your payment being processed. If you have any questions please don’t hesitate contact us!